Everyone at J.W. Hulme Co. seems to have a story about how the finely crafted leather goods made by this St. Paul, Minnesota, company first captivated and then compelled them to become a part of the 110-year-old legacy brand. 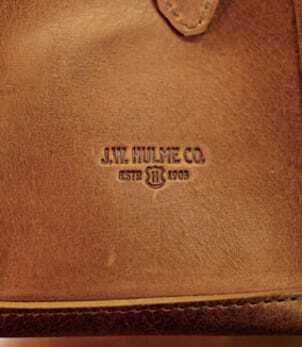 Gene Castle, the company's production manager, found two Hulme bags while cleaning out his parents' garage. They had been his father's, passed down from his grandfather. But over time, they were misplaced and tucked away behind the gatherings of his parent's lives and never passed down to Castle. Josh Franer/Man Made ContentGene Castle is J.W. Hulme's production manager. "I realized they were J.W. Hulme bags," he says. "I took them out and cleaned them up. Then six months later I saw an ad for a (job) at the company that made the bags my grandfather had." He applied for and landed the job that comes with the responsibility of overseeing everything from purchasing leather sourced only from U.S. tanneries, to making certain finished bags make it out of the factory on time. It's a job that Castle speaks of with quiet reverence, particularly for the leather cutters who work with Hulme's most valuable resource. "You have a lot of imperfections, scars, bug bites, heal-overs," Castle says of the leather they work with. "It was once living. So in cutting leather you need to be able to lay out the pattern to get the best yield. 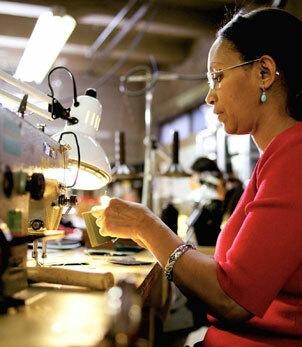 It takes a master cutter, working the dies around the imperfections, it is truly an artform." Dean Vanech, CEO of the private equity firm Olympus Capital Investments that helped saved Hulme from closing up shop forever, was drawn to the company because of its story of survival from World War I tent maker to struggling American leather goods manufacturer. Vanech read of Hulme's problems in a 2009 Wall Street Journal article that chronicled its struggles as a symbol of how the debt crisis was affecting small U.S. manufacturers. Later that year, according the Wall Street Journal, Olympus invested $550,000 in the company. The company's owner, Chuck Bidwell, also managed to pull together another $794,000 by selling some of his vintage Buicks to help reduce the company's debt. Hulme began its slow climb out of near-extinction. Now five years after the infusion of money, Hulme is doing more than surviving. It's thriving. At the company's lowest point, Bidwell had laid off everyone except four people who made bags when the occasional order came in. Today, Castle oversees a team of 37 people who work year-round in the factory. Another 20 people work in product development, sales, online marketing, among other jobs. This summer they all plan to move from their cramped offices and factory into a refurbished can factory that was once an icon of Minneapolis-St. Paul's proud manufacturing heritage. The new space will include a store and an open factory plan that will make it far easier to take a bag from raw leather to delivery. The soul of Hulme can be found in its sewing section of the factory. Here leather that has been cut and skived -- a process that shaves minute amounts off the leather to make the edges easier to stitch together -- comes together to make bags and accessories meant to last beyond a lifetime. Hulme's products range from traditional gun cases to a new line of bright silver leather jewelry cases crafted from the same patterns used to make its fly-fishing reel cases. The sewing room at Hulme upends the idea that industrial sewing is drudgery. "We are so busy in life," says Rachel Selby, who leads a team of sewers. "It's a chance to be quiet, to sit at our machines, (to hear) the whirr, the familiarity of the machines. You do sink into this state and you allow yourself to create just this one thing." Sewers work in teams with their machines pulled together in circles or semicircles instead of impersonal rows. In many cases, one sewer will put together an entire bag instead of sewing one part and handing it off to another sewer. Sewing circles often focus on specific products and in each circle there are people who are experts at tasks like binding or working with the stiff leather, like the sewer from Alaska who learned her skills sewing seal skins. Josh Franer/Man Made ContentZabeida Osman at work. The combination of individualism and teamwork brings a sense of what may best be described as energetic peacefulness to the sewing room. The women and men who work here speak of sewing using words such as "therapeutic," "relaxing" and "piecing together a puzzle." "My heart gets happy when I sew," says sewer Deb Griffin. Ironically, Griffin recalls being mortified during her school years, when an aptitude test told her she had a knack for mechanical skills. But those skills have made her and other sewers like Zabeida Osman invaluable to Hulme as it began its slow climb back. Osman remembers getting the phone call about two years ago that Hulme was hiring again after the layoffs that began in 2008. "I got a phone call around noon," she says, who learned to sew after coming to America from Ethiopia in the 1980s and is now a team leader at Hulme. The caller was the woman who had been Hulme's sewing supervisor. "I knew it was good news. She laughed. I laugh. We both choke. 'Zabeida,' she said, 'Do you want to come back?'" Osman started the next Monday and has grown to love making new products in the expanded women's line that is helping fuel Hulme's revival. Her favorite is the Linwood wallet. "The layers of pockets make it look like a work of art," she says. Josh Franer/Man Made ContentSarah Furnae, Kerrie Gray, Holly Forrey and Amanda Peterson are a tight-knit team. For much of its long history, Hulme focused on traditional hunting and fishing products. Catalogs through the decades show little variation from the themes of manly game bags, gun cases and duffle bags. But as Hulme pulled out of its difficult times in 2010, four women from a local community college with a strong technical apparel program started working at Hulme in product development. Hired separately over the past several years, the four women are now a tight-knit team. 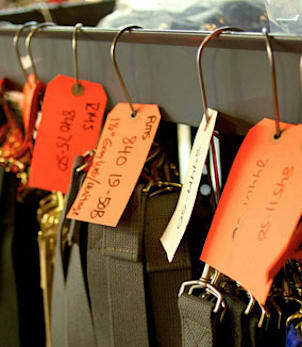 Sarah Furnae, Kerrie Gray, Holly Forrey and Amanda Peterson are equally passionate about Hulme's traditions and can track back rivets, turnbuckles, tongues and handles to bags the company has made for decades. But all of them know that to grow "they have to try cracking the women's market a little more," Peterson says. Working under the tutelage of company's vice president of brand management, Laura Smith, the four women are changing what Hulme makes for women -- but always with an eye to the past and a deep appreciation for the factory just outside their studio door. Around a large table that takes up most of their workspace, the four women work from designs often first imagined on a computer. They create patterns from those designs using the same leather the bag will be made with. Then they begin incorporating different elements from Hulme's past aesthetic to create a cohesive look. One of their favorites is the Henry Crossbody, inspired by the company's signature duffle bag. It has the same solid leather handle, just smaller and more feminine. The shape of the flap mimics the duffle flap with its distinctive shape and buckles. Even on the bag's sides, a spear of leather is a nod to a traditional bag. But their job is much more than picking out the traditional elements to include in new products. 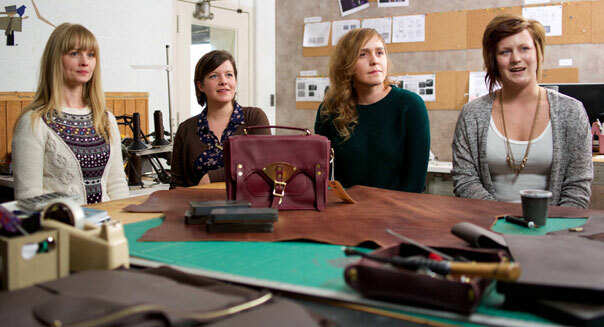 While an outside designer might have a great idea for a new bag, these women know whether it's possible to make in a factory. "It's always evolving," Forrey says. "It never ends up quite how you thought it was going to." 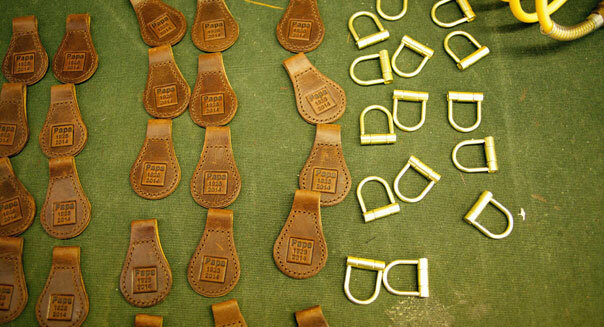 In fact, they are the only people in the company who can make a bag all by themselves, from cutting the leather with the razor-sharp steel dies to skiving leather and using rivet machines. "We know what's possible," Gray says. The women are more than a little proud of the fact that their four-person department does work that puts them in the same league as Coach (COH) or Louis Vuitton. "They don't have four people doing five different departments," Forrey says. "They have four or five departments with lots of people. There are just the four of us to do those jobs and we still go to the markets that those competitive companies go to." More than a thousand miles away in Manhattan, Herschel Thompson is doing his best to make certain the work and the craftsmanship coming out of St. Paul gets noticed -- on the Internet. Hulme likely wouldn't be as successful -- or pulled out of near extinction -- without e-commerce. While its worth has been derided and debated, for many niche brands like Hulme, the Internet as a retailer has been its saving grace. "We've helped define new audiences beyond the rugged adventurers who already knew the brand," says Thompson, who started out as a digital adviser to the company and is now head of e-commerce and digital marketing. "Digital has enabled us to connect with a whole new generation. We had a cult following, but really we are just scratching the surface." Hulme's digital presence started simply as a functional website, but as Thompson has learned firsthand, it's the mythology of Hulme that make people connect with the brand. "Honestly going there blew me away," he says of his first trip to St. Paul. "It inspired me because it was a window on a world I didn't know. I walked across the factory floor and I was holding my breath. If they make a mistake in that bag it was going to be ruined." Inspired like many by Hulme's history, he's working on creating a website that does more than help you click to buy. It has to tell the story of how John Willis Hulme founded the company, how it takes 100 hours to make a Hulme duffle bag, and that's why one can cost more than $2,000. "Certainly for a handbag, women may not care that something's made to last a lifetime. That it's made in St. Paul," Thompson says. He hopes his strategy of marrying storytelling with retail will change that mindset. 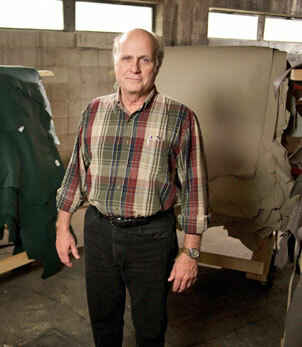 Hulme's story, at its heart, is about the artisans who work in St. Paul using leather from Maine and Tennessee. It's about the value of taking care of something, holding onto it and passing it down to children and grandchildren. It's about paying a little more for a product that won't need replacing. Hulme, as Thompson says eloquently, "is about the values I have, but hadn't really associated with the things I've worked on in the past."